As kids, we weren’t afraid of much. We could set goals, big, small and just go after them. 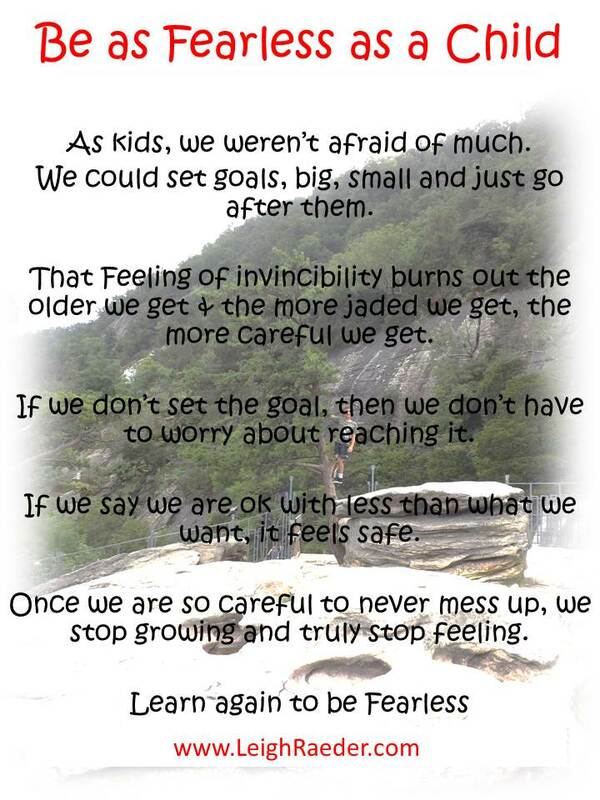 That Feeling of invincibility burns out the older we get & the more jaded we get, the more careful we get. Now I realize that this is a gradual process. But eventually we get comfortable and learn that if we don’t set the goal, then we don’t have to worry about reaching it. If we say we are ok with less than what we want, it feels safe. It’s just easy. Once we are so careful to never mess up, we stop growing and truly stop feeling. As humans, we get into our “Comfort Zone”. Now this isn’t necessarily a bad place, but what about all of the dreams that you had as a child? I understand that as parents, we don’t want our children to get hurt, either physically or mentally. We constantly tell them to, be careful and cautious. I want then to be safe, but as a parent I also want my kids to go out and live life, and be what they want to be! So what is the balance? As an adult, I have been forcing myself to step out of my comfort zone, just for the fact that I personally feel like I have so much to do yet in my life! I have been so fortunate to have absolutely wonderful friends and family that have encouraged me and cheered me along the way. Every time that I step out of my comfort zone, it is so uncomfortable, but each time I gotten so much closer to my personal and business goals. I hope that my children continue to dream up the kind of world that they want to live in and achieve all they’ve ever dreamed of, because after all, they CAN be anything they want to be! And if you feel like you have more you want to achieve, or you’re not where you want to be, just take the first step. It may be hard at first, but it’s worth it, trust me!